Home page News Quick Facts Creating a desire for industry! Industry Week was launched in 2011 and is run by the Ministry for the Economy. It is the key national event and its success just keeps on growing! In 2018, the 2,918 events organized throughout France attracted no fewer than 360,000 participants. Industry Week promotes the industrial sector and highlights the great diversity of its professions. The theme of this 9th edition was “French Fab”, a genuine standard bearer of a dynamic French industrial sector. French Fab brings together companies of all sizes (major industrial groups, intermediate-size enterprises, small and medium-size enterprises) around the shared values of the industry of the future: innovation, excellence, digital technology, etc. 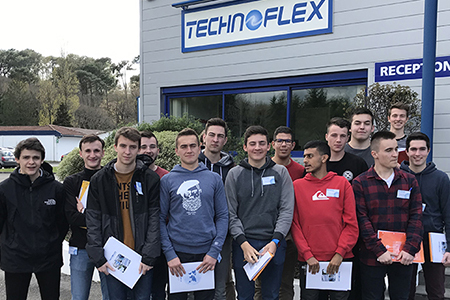 For the occasion, Technoflex once again opened its doors to students from Bayonne and Pays Basque University Institute of Technology. 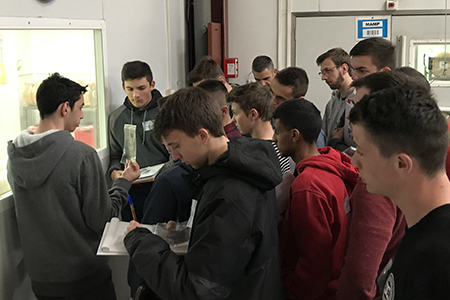 The students are on the University Technology Diploma course in Industrial Engineering and Maintenance and got the chance to discover the range of industrial equipment and manufacturing processes for our bags and connectors.